Harvest when flowers are about 50% open. Plugs can be stored for 2 weeks in the dark (3 weeks in light) at 50F and subsequently grown into very acceptable plants and/or flowers. Being short-day plants, growers should light and pinch them accordingly before planting them in the field or greenhouse as suggested by Porat et al. (1995). The scientific name is from the Greek word “kelos” which means burning and refers to the brightly colored and character of the flowers. The variety name ‘plumosa’ means feathery. 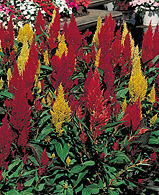 Many members of the amaranth family are considered weeds such as pigweed, tumbleweed and water hemp. A favorite cultivar is ‘Kimono’ having many colors. Good as dried flower. Remove leaves before drying. Reid (2000) demonstrated that flower food effectiveness varied greatly depending on brand name compared to plain tap water and a bleach/tap water solution. Using ‘Forest Fire’, Redman et al. (2002) reported that 45F was the best storage temperature tested (they did not try higher temperatures), at 45F they could be stored wet for one week or less, STS was not effective and flower food decreased flower life.